Byrd's Books will host author R. J. Theodore on Tuesday April 17 at 7 p.m. to celebrate the release of her book "Flotsam" (Peridot Shift #1). 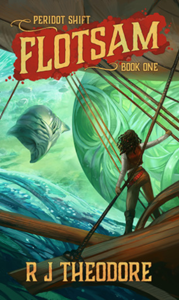 About the book: "Flotsam" is a fantastical steampunk first contact novel that ties together high magic, high technology, and bold characters. Captain Talis just wants to keep her airship crew from starving, and maybe scrape up enough cash for some badly needed repairs. When an anonymous client offers a small fortune to root through a pile of atmospheric wreckage, it seems like an easy payday. The job yields an ancient ring, a forbidden secret, and a host of deadly enemies. Now on the run from cultists with powerful allies, Talis needs to unload the ring as quickly as possible. Her desperate search for a buyer and the fallout from her discovery leads to a planetary battle between a secret society, alien forces, and even the gods themselves. Talis and her crew have just one desperate chance to make things right before their potential big score destroys them all. About the author: R J Theodore lives in New England where she splits her time between writing, reading, and design. She has been a voracious reader as far back as she can remember, staggering her parents with the piles of new paperbacks she would hunt down in local bookstores. Her broad tastes have lead her to write novels that aren’t easily classified into any genre but are guaranteed to be an adventure. She wrote (though never finished) her first novel at age 13. It was Star Trek fan fiction, and it’s probably best that it’s been lost to the ages (Though her publisher would very much like to read it. – Ed.). As she approached college, her focus switched to illustration and design, but she rediscovered storytelling through narrative after graduating from art school. With the release of "Flotsam," Theodore will debut her Peridot Shift series of steampunk first contact novels.